Upon arrival in Frankfurt, optional private transfer to your hotel. Free time and overnight in Frankfurt. Explore the city of Frankfurt on a regular city tour. Hop on and hop off at the stops of your choice and take your time getting around the city. You are going to visit the Paul church, the financial center, its skyscrapers, the neighborhood of Römerbergsquare and the wonderful city views from the Hauptwache. The afternoon is at your leisure, go shopping on the famous commercial street “Zeil” or visit Goethe's house, the birthplace of the great German poet. Enjoy a day at leisure in Frankurt or an optional day tour to the Rhine. Explore the vinyards and the most picturesque villages in the Rhine River valley. Take a boat tour through the Lorelai Valley and admire the medieval castles. Lunch and wine tasting in a Rhine River restaurant. Take a short stop at Rudesheim on the way back to overnight in Frankfurt. After breakfast board the train to Munich. Transfers are optional. Today you will explore the city with a regular tour using the Hop on/Hop off tourist bus. You can disembark at any stop and take your time to get to know the city. 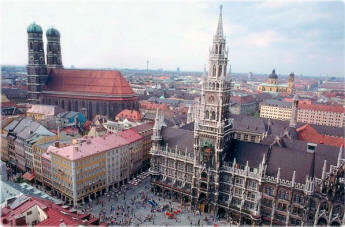 Highlights include the Marienplatz square, the City Hall, the famous Church of our Lady and the Viktualienmarkt street market. In the solitude of the mountains and amidst an idyllic landscape, "Mad King“ Ludwig II built two of his fairytale castles: Neuschwanstein and Linderhof. Take a regular excursion to visit these two architectural wonders (admission not included). Enjoy a short stop in Oberammergau, the town known for its Passion play, wooden crafts and charming painted houses. Afternoon return to Munich. Board the train to Berlin. Transfers are optional. Walk to the meeting point to board the regular city tour bus (Hop on/ Hop off bus). 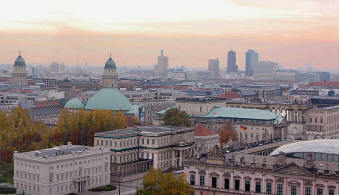 Visit some of Berlin’s attractions, including the Kurfürstendamm, Brandenburg Gate and Potsdam Square. End of services. Optional private transfer to the airport. During Fairs, Congress and Holidays a surcharge may apply. See a fully escorted version of this tour from Frankfurt.